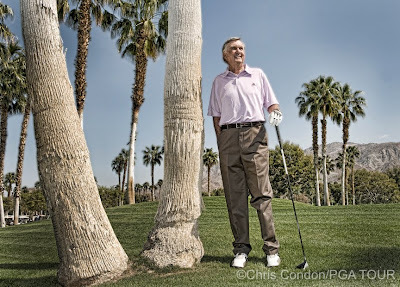 Monday after Toshiba, I drove east to Palm Desert for a quick shoot with Al Geiberger, "Mr. 59". Al was the first PGA TOUR professional to card a 59 during an official event in 1977. He has even trademarked the name "Mr. 59" and his cell phone # ends with 5959! parking lot discussing the "Stack & Tilt" swing method. some of the concepts into my game.